A referee who faced intense scrutiny after forcing a New Jersey high school wrestler to cut his dreads or forfeit the match has taken his first steps in filing a lawsuit alleging defamation and emotional distress. 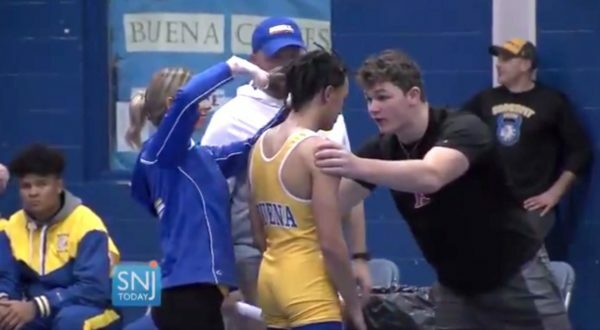 This week, referee Alan Maloney sent a tort claim to nearly a dozen possible defendants arguing that he “properly performed his duties as the referee and fairly applied the rules governing a wrestling match” when he ordered Black varsity wrestler Andrew Johnson to cut his dreads, NBC News reported.Johnson, a student athlete at Buena Regional High School, was wearing a head covering at the time, but Maloney, who’s white, said it simply wouldn’t do. Johnson was forced to make a decision moments before a high-stakes match in December 2018, and viral video of the incident showed the teen looking defeated as a trainer from his school took a pair of scissors to his hair, cutting it off in chunks. The footage soon made its rounds on social media, sparking immediate backlash and claims of racial bias. In the filing dated March 6, Maloney argued that neither Johnson’s hair nor his headgear was in compliance with the league regulations. However, the athlete’s parents said Maloney was tardy to weigh-ins at the match that day and made no objections about the length of their son’s hair when he evaluated him before the match. They added that Johnson was allowed to wear head coverings in the past, but Maloney objected to it. New Jersey’s state Civil Rights Division and its interscholastic athletics association (NJSIAA) have since launched separate investigations into the incident. Fallout from the video also prompted Buena school district officials to no longer send its athletes to contests officiated by Maloney, who was ultimately barred from officiating at meets pending the outcome of the two investigations. The referee’s complaint lists his injuries, damages or losses as defamation of character, loss of income and emotional distress, according to NBC News. The neighborhood of Buena, its high school, school district and the state’s interscholastic athletic association are among the defendants named in the filing. “His description of events misstates the facts and the applicable rules, both of which show that Andrew should have been permitted to wrestle — just as he did four days earlier — without a hair covering, without having to first cut his hair, and without Maloney’s unjustified interference,” Speziali said in a statement. Maloney’s filing seeks $100,000 in damages.